A few of you have asked for a kitty update. Here it is, hopefully without boring you too much. 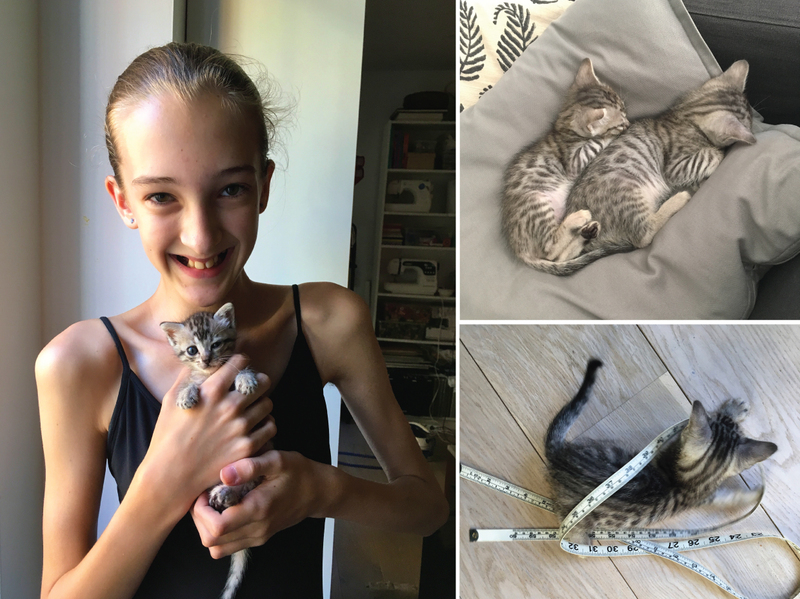 Luna is doing great, turning into a really sweet and fun kitty with lots of energy. She plays with anything and everything–I’m missing a sock again today–until she’s completely exhausted and then she crawls up onto my lap (or sometimes into the trash basket) for a nap. Puck, however is still struggling. We’re headed back to the vet this afternoon for a sonogram to see if something inside him isn’t quite right. He’s still vomiting pretty much anything he manages to get down, and he’s not growing as fast as his sister. So we’re worried. And I’m exhausted from cooking special bland diets for him and holding him all the time. He’s napping inside my jean jacket, which I’m wearing, as I type this. But he’s an absolute sweetheart and a total lap cat. And we’re hopeful that he’s going to be OK.
I’ve been wanting to try something similar to this since we released the Lisette for Butterick B6598 pattern. It’s cut out, so I’ll let you know how it goes soon. Here are a few more Neighborhood ideas. 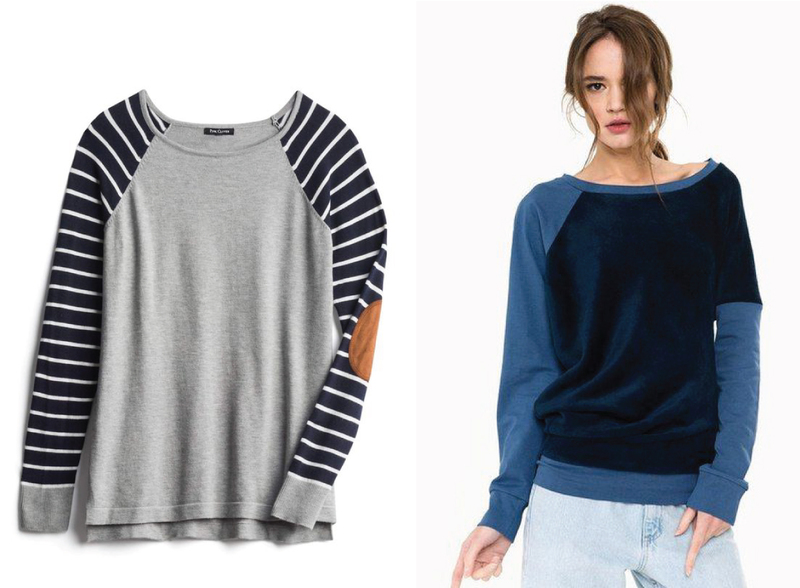 I love the striped sleeves and the elbow patches on the left, and if you use one View A sleeve and one View B sleeve you could do similar asymmetrical color-blocking to the shirt on the right. 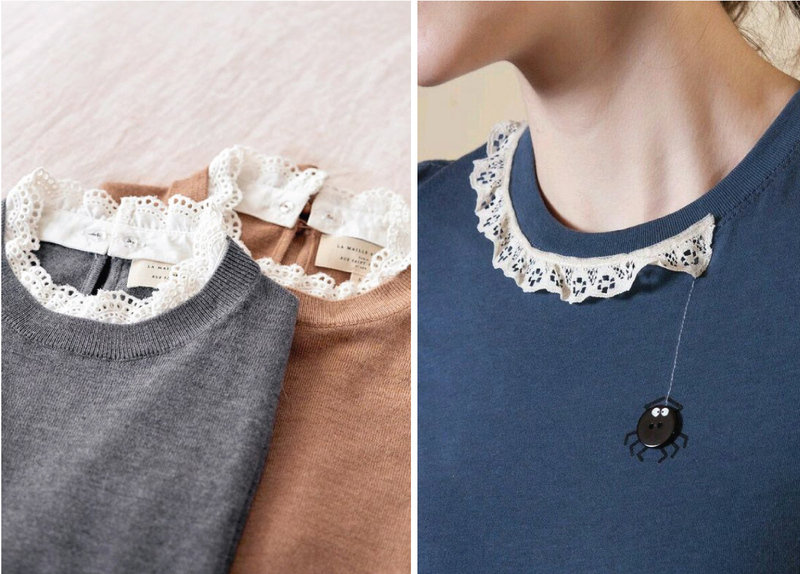 Aren’t these lace collars pretty? What a fun Halloween-y detail, too! A library that loans interview attire? Brilliant! If anyone tells you your interest in fashion is frivolous, here’s your response thanks to the very thoughtful Valerie Steele. Someone come up with a really, really good reason why I must go to London in 2019, OK? I mean, in addition to this one. How great to bring back traditional costume again! I’m really hoping this happens here in Spain where only the elderly and the very young wear regional costumes for special fiestas. As if penguins wearing sweaters wasn’t cute enough already, one of them is wearing a Penguin penguin sweater! And I won’t even mention that they’re knitted by Australia’s oldest man because that would just be too much adorable for all of us, right? Don’t forget to come back next week because we have a lot of fun posts planned! Including a whole pack of Afternoon Tea Blouses that will knock your socks off. Took me a moment to see that those were toy penguins in the sweaters! I guess it would have been hard to get the real ones to line up for the photo… Sending good thoughts to Puck, hope it’s something simple to fix. My daughter would love a t-shirt that says “my dirndl is in the wash”! She is proud of her German surname. Or, better yet, a dirndl! Bless you for your patience and exhaustion with Puck. I hope he is better soon. Our last rescue pup had mange so badly it was life-threatening. I bathed him every day for months….it was exhausting…but worth it. Wishing the same happy result for little Puck. Love the neighborhood ideas by the way! Good morning from Perth West Australia. I’m new to your site and loving what is there. I’ve been making your bucket hats for kids and am quite addicted to them, and playing with fabrics that will give the cuteness factor to the hat. Yesterday I played about with a casing inside the hat in order to thread a cord so the hat can fit smaller heads until they grow into it. Worked really well. Now to try it on Henry and see what he thinks. Ooh great picks!! Hope Puck is okay! My littlest will love the penguin story!